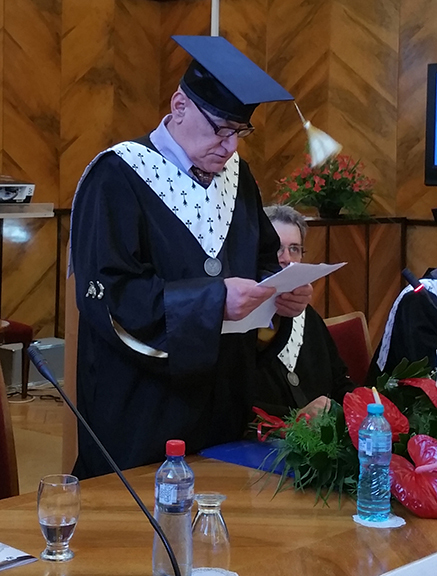 The Alexandru Ioan Cuza University of Iasi honors, by granting the title of Honorary professor of the University, the well-known researcher and professor in the field Finance, Seyed Mehdian, from the School of Management on March 31st in Iasi, Romania. In 2008, Dr. Mehdian initiated the School’s cooperation with the Alexandru Ioan Cuza University of Iasi, the Faculty of Economics and Business Administration on a Student Exchange Agreement. Dr. Mehdian is also member of the editorial board of the Scientific Annals of Economics and Business, research journal published by this Romanian University. Granting the title of Honorary Professor to Mr. Seyed Mehdian, is a recognition for his outstanding involvement in the field of Finance, for his efforts, initiatives and substantial contributions to the scientific knowledge, as well as for his involvement in the development of relationships with the academic environment from Iasi. Read more about Dr. Mehdian HERE.